Not everyone can afford to camp out online for tickets, trek out to Coachella, or spend hundreds of dollars for tickets to an event. Luckily, digital content and social media afford women everywhere the opportunity to follow these cultural events from the comfort of their own home, while they're at work, or on the go. As part of the POPSUGAR Insights Content, Culture, and Commerce study, we surveyed over 1,500 women between the ages of 18-44 and asked them to share why they enjoy following cultural events via social media or digital content. Nearly 50% of women say that they follow cultural events of all types via social media and digital content because they enjoy seeing what took place at the event. Thirty-eight percent of women say that they follow online because they want to read about people who share their passions who have written content on the subject. 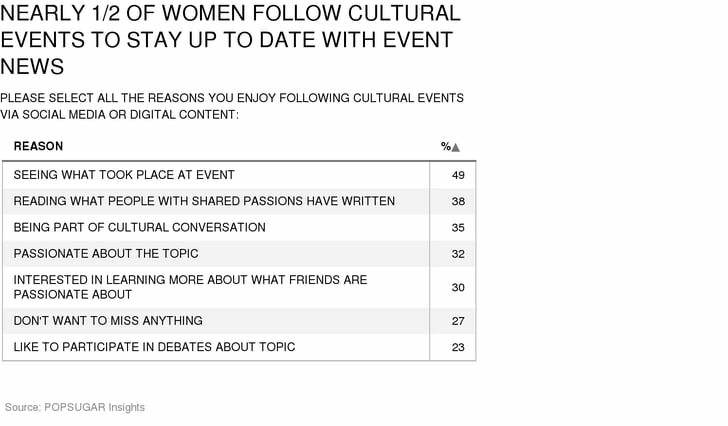 Over 35% of women say that they enjoy diving in and being a part of the cultural conversation on the event topic, and 32% of women say they are passionate about the topic in general. Twenty-seven percent of women are obsessed with cultural events and don't want to miss anything at all having to do with an event.